I believe that one of the reasons that Oregon is so sleepy on race and criminal justice reform is that we have a false belief that we’re one of the “good states” and therefore don’t need to worry about it. 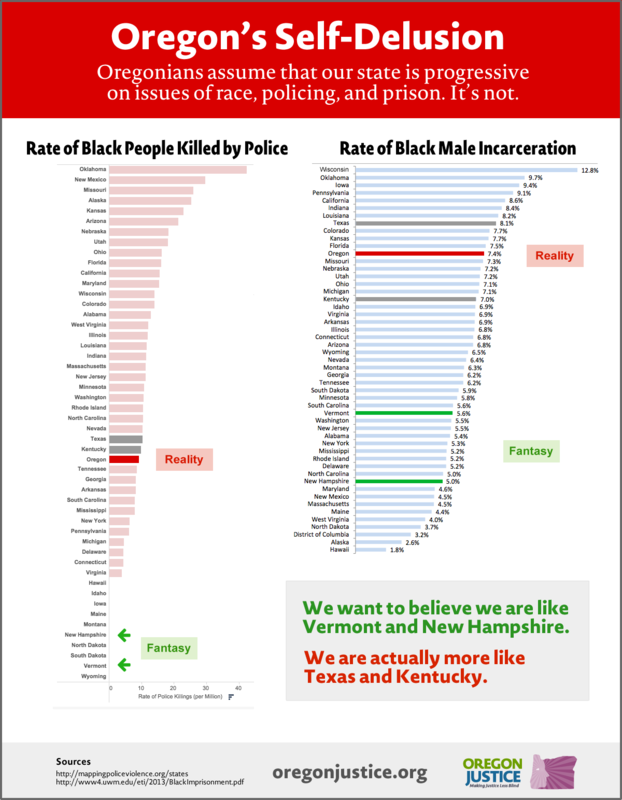 I created this graphic to show where we actually stand compared to the rest of the US on race, policing, and prison. It pulls from two sources, this tool to show rates of police killings of black people and this pdf on black imprisonment. Admitting the problem is the first step in solving it. Posted on October 28, 2015 October 28, 2015 Leave a comment on Is Oregon on the cusp of building a new prison? New article from The Guardian highlights several officers at OSP – ‘Prison guards can never be weak’: the hidden PTSD crisis in America’s jails. The article interviews several correctional officers about PTSD, suicide rates, the culture of prison guards, and how DOC is (and isn’t) responding to this widespread problem. It doesn’t discuss how guards’ PTSD affects how they treat inmates, the rates of PTSD and suicide amongst inmates (which are also very high), or whether prison as it is currently conceived is fundamentally capable of producing healthy outcomes for anyone involved. For an examination of how prison affects the long-term mental health of inmates, read about Post Incarceration Syndrome and Relapse. …The last major study on mental health in prisons, conducted by the Bureau of Justice Statistics, found that 64 percent of inmates in state and federal prisons met the criteria for mental illness at the time of their booking or during the twelve months leading up to their arrest. For comparison, the rate of mental disorders among U.S. citizens stands at around 25 percent, according to the NIH. Sixty-nine percent of the country’s prison population was addicted to drugs or alcohol prior to incarceration. The violence that is giving these guards PTSD is something that could be prevented by treating mental health issues before they escalate to criminal behavior in the first place–and by treating violence in general as a symptom of untreated trauma rather than as a moral failing. Trauma can be healed, but trying to “punish away the symptoms” just doesn’t work.